That's great. You can have your boys and leave mine all to me! 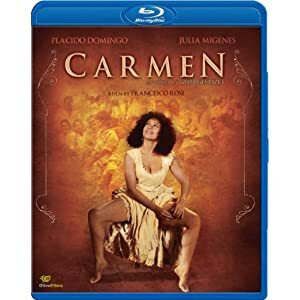 The legendary 1984 MINGES / DOMINGO Carmen (movie version) finally rises from the grave in Blu Ray!!!!!!!!!!!!!!! Wow! I want it too! Will it be released earlier in Europe? I can't wait! Damn! I never knew Rugerro looked that . . . hot! What do you think started me on this mad DVD purchasing spree - the memory of this film, the excitement of finding it on Amazon, that first parcel (before the courier knew my name and shoe size). Last edited by DarkAngel; Jul-05-2011 at 13:22. Don't have a blu-Ray player so maybe not worth it at this point. Natalie, you should definitely upgrade. They are quite cheap now, and the jump in quality of image is great; but even better is the jump in quality of sound. A DTS Master track or a Dolby True HD track on a blu-ray are something that puts DVD sound tracks to shame. There are blu-ray players now for less than $100. The performance is fantastic, musically. However, there will be divided opinions on the production. Kusej tells the story in a completely new way, sometimes with drastic imagery. This is no beautiful world, and not to everyone's taste. Those who let themselves enjoy it will experience one of the most exciting operas of the last few years. But Kusej does not make it easy. Last edited by FragendeFrau; Jul-06-2011 at 01:57. The performance is fantastic, musically. However, there will be divided opinions on the production. Kusej tells the story in a completely new way, sometimes with drastic imagery. This is no beautiful world, and not to everyone's taste. However, those who let themselves enjoy it will experience one of the most exciting operas of the last few years. But Kusej does not make it easy. The performance is fantastic, musically. However, there will be divided opinions on the extensive use of push-up bras. Kusej tells the story in a completely new and bosom-fixated way, sometimes with incredible displays of cleavage. This is no flat-chested world, and not for people who can't handle all that excitement. However, those who let themselves enjoy amazing displays of breast augmentation will experience one of the most exciting mammary extravaganzas of the last few years. But Kusej does not make it easy on your blood pressure. There, Alma. I hope that's helpful. OH RIGHT. I have ordered five copies. You know, in case some get lost in the mail, or some break. Hang on a minute. Did I not do a review of Rusalka in the misc DVD thread? Yes you did, I've read it already and ordered it, thanks. So your review has motivated me to order the first copy. The other four, I've ordered after amfortas' revised translation. Last edited by Almaviva; Jul-06-2011 at 17:18. I think that you will find that the Amazon UK review rating has just improved. All times are GMT +1. The current date and time is Apr-25-2019 17:21.